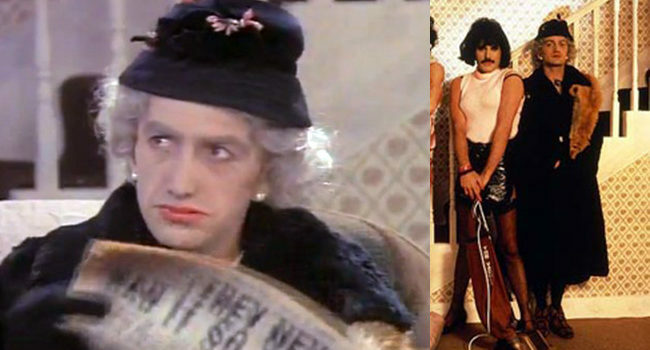 Queen’s 1984 video for their song, “I Want To Break Free” featured the foursome dressed in drag as characters from “Coronation Street” a long-running soap opera from the United Kingdom. This includes John Deacon as Ena Sharples. Unfortunately, MTV execs and fans in the United States didn’t get it and it caused a minor controversy, stalling their career stateside, until at least the early 90s, after frontman, Freddie Mercury’s death. The video is now considered a camp classic. Queen’s 1984 video for their song, “I Want To Break Free” featured the foursome dressed in drag as characters from “Coronation Street” a long-running soap opera from the United Kingdom. This includes Roger Taylor as Suzie Birchwell. Unfortunately, MTV execs and fans in the United States didn’t get it and it caused a minor controversy, stalling their career stateside, until at least the early 90s, after frontman, Freddie Mercury’s death. The video is now considered a camp classic. Boy with Duck Decoy is the subject of a photograph taken in Passaic, New Jersey in 1968 by Arthur Tress, an American photographer known for his surrealist and expressive photos. A boy, for unknown reasons, is wearing a colander for a hat, while holding a wooden decoy duck in front of an industrial waterfall. Uncle Grandpa is everyone in the world’s magic uncle and grandpa. He’s usually found traveling the world with his friends, helping people solve their problems. He is a silly person who likes to eat inedible objects and is accompanied by a red talking fanny pack named Belly Bag. The alter-ego of superhero Raven from “Teen Titans Go!”, Raven’s usual outfit is replaced with a saffron-colored sleeveless leotard with matching cuffs and yellow booties. Her leotard has the logo of a golden leg in a darker-colored circle on the chest area. You could wear it under a regular Raven costume for extra fun! Queen’s 1984 video for their song, “I Want To Break Free” featured the foursome dressed in drag as characters from “Coronation Street” a long-running soap opera from the United Kingdom. Unfortunately, MTV execs and fans in the United States didn’t get it and it caused a minor controversy, stalling their career stateside, until at least the early 90s, after frontman, Freddie Mercury’s death. The video is now considered a camp classic.